What are you eating today? Well, it’s a Wednesday, so probably too early for that cheeky takeaway, but I did make my own lunch on Monday and Tuesday, so maybe I deserve a midweek treat, right? But hold your horses there guy, before you reach for the nutritious and delicious sushi that ticks all boxes of tasty, healthy and quick, there’s bad news coming in for fish lovers in Australia – sushi’s impeccable reputation is being smeared, and not with wasabi. It turns out that fresh fish is being preserved longer that it should be thanks to the odourless gas carbon monoxide. Yes, that carbon monoxide. The Department of Agriculture and Water Resources have said there is proof this kind of preserved fish is being imported into the country, and it is now taking steps to stamp out the practice. 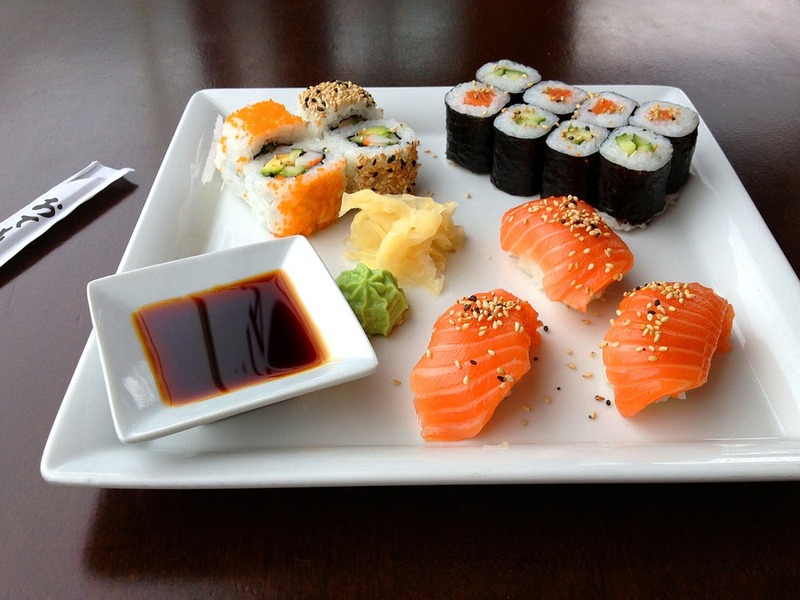 As the Daily Mail reports, Australia is planning to stop fish products marketed as ‘fresh’ at sushi restaurants from being pumped with the poisonous gas by overseas suppliers. The treatment process, most commonly used for tuna, helps maintain the bright colour and appearance of the fish. However, under the Australia New Zealand Food Standards Code, it is illegal for suppliers to do this and import the fish to either country. There is evidence that imports of tuna are being treated with carbon monoxide to fix the colour of the flesh. The department is proposing to actively enforce this prohibition at the border later this year. An Imported Food Notice is expected to be issued in June detailing new inspection and testing requirements for imported tuna. Some people might not see a problem, you can’t expect raw fish to make it from the sea to your favourite restaurant or shop without going through some kind of process. The trouble is some suppliers are using this process to disguise fish that is up to a year old and pass it off as ‘fresh’. 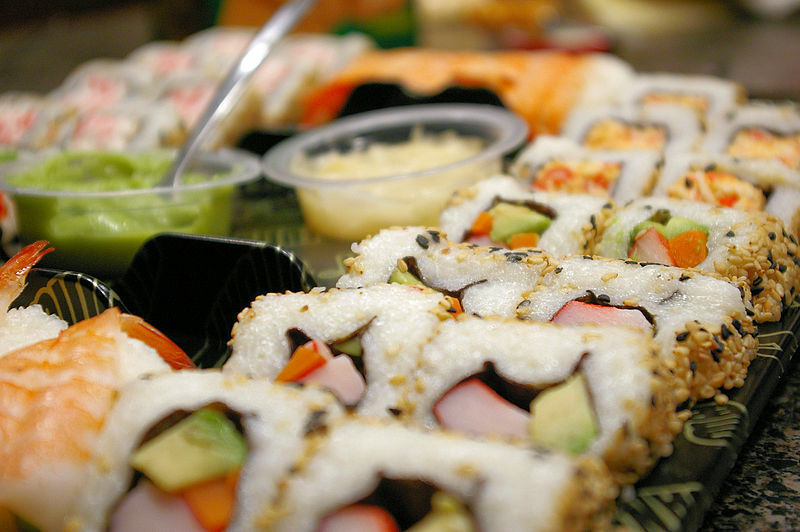 No matter what anyone says, sushi, unlike beef or wine, does not age well. 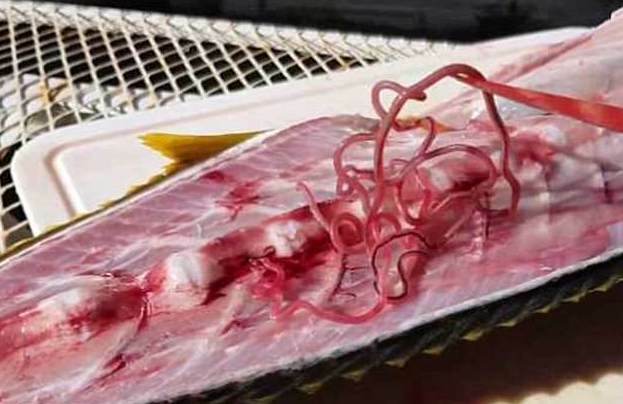 A fisherman who caught a Yellowtail Kingfish – a fish common in sushi dishes – found eight parasitic worms as he filleted the fish last month. The unfortunate fisherman caught the Yellowtail off the western coast of Australia. Got a yellowtail kingfish off Rotto, and got a total of about eight of these worms from the flesh, are they the same over east? Seem to be a common thing here in the west as it’s not the first time. Associate Professor and expert in Aquatic Ecosystems at Murdoch University in Perth, David Morgan, told Yahoo7, the parasite is a roundworm or nematode. There are possibly a lot of cases that go undiagnosed. Treatment is either by removing the nematode(s), or the nematode passes. The best preventative strategy is to not eat raw or only partially cooked fish. Who’d have thought selling raw fish as food could be so problematic?